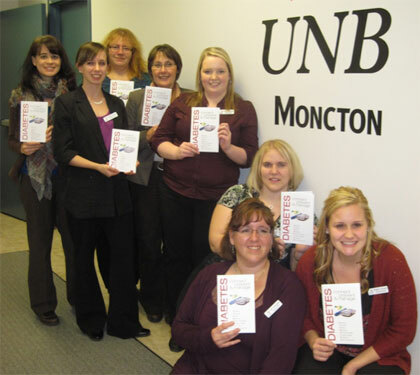 Third-year nursing students at UNB Moncton recently launched a booklet called Diabetes: Connect, Prevent & Manage. This booklet promotes healthy living and highlights community resources in the Moncton area and surrounding communities. While the target population is the diabetes community, this booklet also has resources for those interested in healthy living and the prevention of diabetes. As 1 in 4 Canadians has diabetes or pre-diabetes, the student-group hopes this resource booklet will be helpful and useful. The resource booklet was launched at the recent Moncton Diabetes Peer Support Group. This support group holds their meetings at the Moncton YMCA on the 3rd Tuesday of every month at 7 p.m. Copies of the booklet are available at this support group, Jean Coutu Riverview, some Diabetes Education Centres, VON Moncton, The Moncton Public Library, and various other locations. It has been distributed to local health care professionals, including local physicians. The project was funded by David Ford at Jean Coutu Riverview, LifeScan Canada Ltd., and the VON. For more information, contact diabetesmoncton@gmail.com (until Jan. 1).